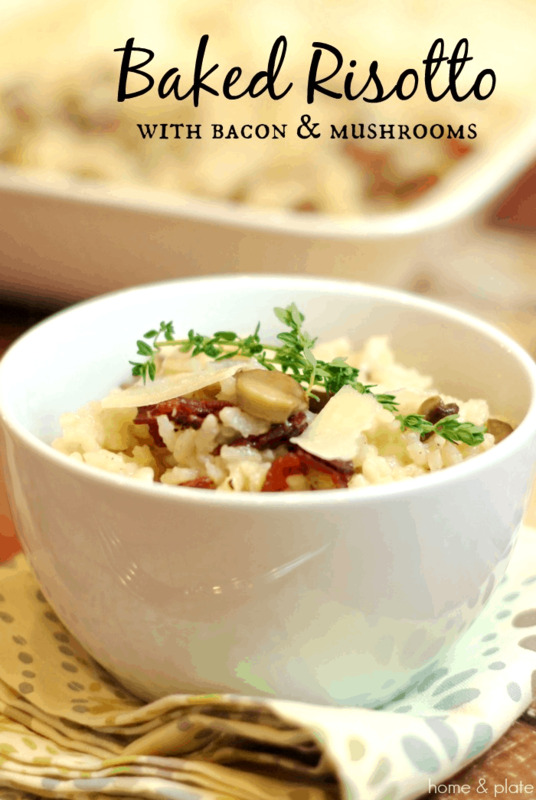 Oven baked risotto with bacon and mushrooms is the best way to make risotto. It eliminates the necessary stirring and the result is just as delicious. I’m a big fan of risotto. I love the chewy texture and paired with bacon and fresh mushrooms, this side dish pairs beautifully with anything off the grill. I don’t know about you but this summer we are doing a lot of grilling. Finding sides to go with our main course is the challenge. This risotto recipe hits the spot. 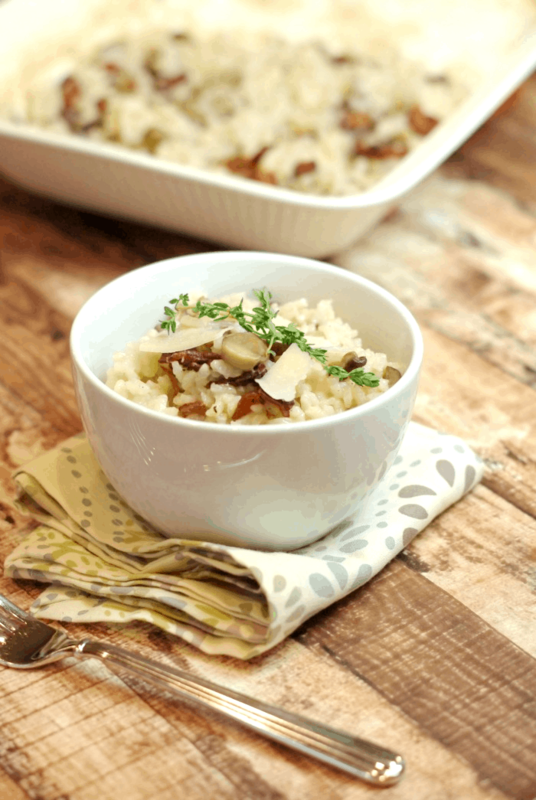 But who wants to stay put stirring the pot as traditional risotto requires? Not me. That’s why this recipe is perfect. You can step away from the stove and wait for your oven to do all the work. Everything is better with bacon. 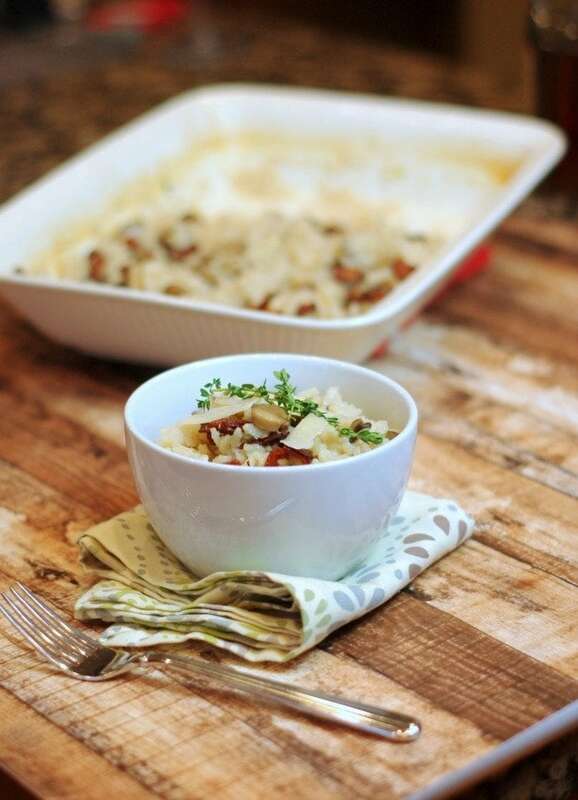 And this oven baked risotto is no exception. It’s the perfect complement to any grilled meat, chicken or seafood and is easy to reheat if you wish to make it ahead of time. Pair it with my Spicy Grilled Shrimp Skewers or my Beer Can Chicken for a complete meal. Risotto cooked on the stove top requires constant attention. Liquid is added in increments as the rice absorbs and thickens. And stirring is necessary throughout. Baked risotto is the answer. It eliminates the necessary stirring and the result is just as delicious. 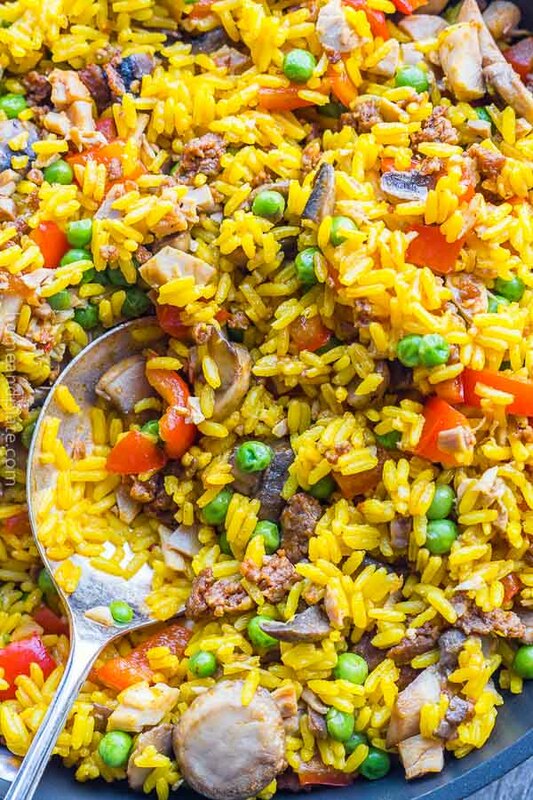 In this recipe, the flavors mix together beautifully. Adding a small amount of white wine adds to the complexity of the flavors. Delicious with bacon and mushrooms, risotto is also tasty with grilled vegetables, grilled chicken or sausage or a variety of fresh herbs. Preheat the oven to 425°F. In a large pot on medium heat, fry the chopped bacon until crispy. Remove to a paper towel lined plate. Remove the bacon grease from the pan. Add the olive oil and onion and sauté until translucent, about 3-4 minutes. Add the rice and stir for a minute. Pour in the wine and mix until the the wine has been absorbed by the rice. Season with freshly ground pepper and stir in the water and chicken broth. Transfer the rice mixture to a casserole pan and place in the oven. Add the mushrooms and butter to the pot and cook until soft. Stir in the cooked bacon and fresh thyme. 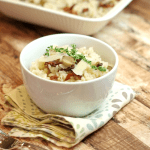 Transfer the mushrooms and bacon to the casserole pan and stir the risotto to incorporate. Return the pan to the oven and bake the risotto until the liquid has been absorbed, for a total of 30 minutes. Sprinkle the Parmesan cheese over the risotto and serve. Serves 6. Total time 40 minutes. It’s a keeper and I’m sure will become a family favorite. Enjoy! I absolutely love everything about this from the ingredients to the method of cooking it. YUM. I haven’t had lunch yet, and you just reminded me that I’m starving! Oh this looks delish!! I really need to give this a try! Mushroom risotto is my absolute my favourite but you are right, standing at the stove takes forever! So intrigued! I promise this is the new way you’ll make risotto. Enjoy!